Kit is similar in cost to a bleed! As far as we’re aware, the Independent Electronic Boost Control (IEBC) is unique in the approach that it takes to controlling boost. So what is makes it different? Add to this the fact that the Independent Electronic Boost Control in kit form costs very little (AUD$80 + hand controller at AUD$60) and you have a killer boost control system! If you expect to build the kit, fit it to a car, tune the boost curves and being happily blasting around the road – and do it all in a few hours – you’ll be disappointed! So how does it work? The IEBC measures engine load by monitoring injector duty cycle (ie how long the injectors are open for) 200 times a second. By using injector duty cycle as the input, it always knows exactly how much load the engine is under – and it provides the boost that you’ve chosen to match that load. 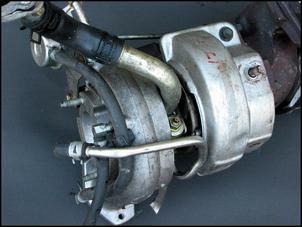 The control of boost is achieved by varying the wastegate solenoid duty cycle. So in summary, all that’s done is to set what wastegate duty cycle applies at each injector duty cycle. Sound a strange way of doing things? Nope. It has huge advantages over a control system that measures boost pressure and then always tries to make it as close to maximum as possible. In fact, if you’ve driven a big turbo car with a traditional "keep the wastegate shut until 20 psi is reached" you’ll know that such a system has terrible throttle control. At high revs you might get 20 psi boost at half throttle, three-quarters throttle and full throttle – which makes much of the accelerator’s range useless for finely controlling power! Cornering a car like this on the throttle needs huge skills, as waves of boost keep coming and going with slight ankle twitches. But with the IEBC you always get boost that’s proportional to throttle position (cos throttle position is proportional to load). So at 4000 rpm, half throttle, you get less boost than at 4000 rpm, full throttle. If you put your foot down, you still get max boost so there’s absolutely no drop-off in available power, but at the same time you get far better throttle control. And making boost proportional to load also decreases the average temp of the air the intercooler sees. But even if you’re only interested in full-throttle performance, the IEBC has huge advantages over its nearest cost competitor, a pneumatic bleed. For starters, you can keep the wastegate shut as engine load increases, completely dialling-out wastegate creep. Then you get easily get rid of the drooping top-end boost curve that often occurs with bleed systems. And finally, there’s in the in-cabin switch that lets you select two completely different boost curves – nope, not just peak boost levels, but the shape of the entire boost curve. That means you can have a wet weather map that brings on boost more gently and peaks at a lower level, for example. The dry road map? Well, that can have a heap of wastegate anti-creep built in and hold boost at a higher level. To make this boost control system happen you’ll need three things: the IEBC kit, the Digital Hand Controller Kit, and an electronic boost control solenoid. (If your car already has an electronic boost control solenoid, use that. Otherwise, source one from a wrecker.) The kits need fairly good soldering and component recognition skills to assemble them, so if you’re a beginner in this area, we strongly suggest you buy the built-and-tested versions. However, as you’d expect, the built versions are more expensive than the kits. We strongly suggest that you also buy the book: High Performance Electronics for Cars. Not only will this give you instructions in colour (important for some of the wiring diagrams), but it also has chapters on how electronic car systems work, how to build kits, and so on. Unless it’s set so that it’s ether fully open or fully shut, the boost control solenoid is pulsed 10 times per second. When only a small amount of air is required to pass through it, the time that the solenoid is open for is very short. When lots of air needs to pass through it, the solenoid is open for much longer. This opening time is called ‘duty cycle’ – the expression has the same application as with injectors. However, at 70 per cent duty cycle, the solenoid is open for over two-thirds of the time. Most boost control solenoids will work over the range of 5-80 per cent, giving 75 different levels of airflow through the valve. Since you can set the solenoid airflow at 1.5 per cent injector duty cycle intervals, there are thousands of different values that are available to control boost! But don’t panic: if you want a smooth boost curve, road tuning soon shows the values to use - once the map has been started, the rest of the figures are easy to select. We’ll cover more on boost tuning next week. It’s very important that you test the operation of the controller before trying to adjust boost with it. In addition to checking that all is working as it should be, the tests will also make you familiar with how the system works. To make it easy to see what’s happening, the controller has three status LEDs on the board: one for power, one showing input signal and the other output signal. As shown in the instructions that come with the kit, the first step is to connect the input to an injector. This provides the duty cycle signal from the injectors, so the controller always knows the engine load. When the injector is connected, an INPUT load number will appear on the hand controller, which will change as the engine is revved. But what if this doesn’t happen? There are two reasons why it might not. Firstly, you may have connected to the wrong side of the injector. 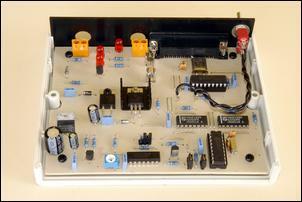 And secondly, the pot on the board needs to be adjusted until you get a clean input signal. When the input signal is working correctly, the ‘input’ LED will also get brighter with greater input duty cycles. IOTW, as engine power output increases, the LED gets brighter. If you cannot get a consistent input signal, even with the pot adjusted, you may have a car that has ‘peak/hold’ injectors. In that case, you’ll need to buy and build the Peak/Hold Injector Adaptor kit. Refer to High Performance Electronic for Cars for more details. Sometimes, the controller will jump back and forth between two input load sites (eg 3 and 4). If this is the case, make sure you increase the output number on both load sites so that the output is consistent. Without power, input and output all working correctly, the boost control will never work! Constructors who have found that their IEBCs don’t work have most often made mistakes with the on-board links. When positioning the links, make sure that you follow the overlay diagram in the instructions, NOT the overlay screenprinted on the board or the photo in the instructions. (The board screenprinting and the photo are for the Digital Pulse Adjuster, which uses the same board but different software in the PICs.) Also note the two PICs each contain unique software – they can be differentiated by the placement of a stripe or a dot on them; the instructions (see the first few pages) show which goes where. Blow through the solenoid and check that at zero output, the solenoid is shut and that at 100 per cent output, the solenoid is open. Then try some in-between duty cycles and check that the flow varies as it should. Next week we’ll install the boost control solenoid and do the on-road tuning. But before you get to that stage, always make certain the system is working properly by doing the tests shown above. So how did this kit come about? The Independent Electronic Boost Control was developed and designed by Silicon Chip [www.siliconchip.com.au] electronics magazine. The kit, along with many others, is covered in the Silicon Chip publication, High Performance Electronics for Cars. The book is a must-have for DIY modifiers. The kit for the Independent Electronic Boost Control is available from Jaycar Electronics [www.jaycar.com.au] or through the AutoSpeed shop . So by no means should the Independent Electronic Boost Control be seen as an AutoSpeed-developed project, at the same time I am happy that AutoSpeed endorses it and promotes it.